All ARTnGame assets on lower price !!! Artengame consists of a group of dedicated participants, that have been developing an ambitious 3D RPG. The game stated in XNA and has moved to Unity3D. It is a game of exploration, party based, real time combat and as amazing art as we can put in. The project is very large and with graphics that try to rival the big boys, so Unity and asset store was the key to actually having a demo close to completion and the whole gameworld constructed. 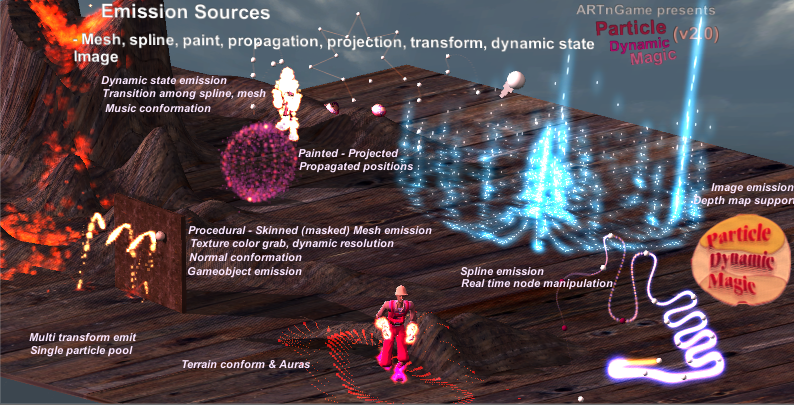 After years of developing systems for the game, we felt that the in house developed systems we used could benefit other developers and thus we are now officially on Unity asset store with the Particle Dynamic Magic particle framework for advanced particle, spline & dynamic decal effects, GI Proxy system for fully real time Global Illumination, Sky Master ULTIMATE for a complete sky, weather & water solution and InfiniDy series (InfiniGRASS, InfiniTREE) for extreme foliage & decal optimization, view distances and next generation look. 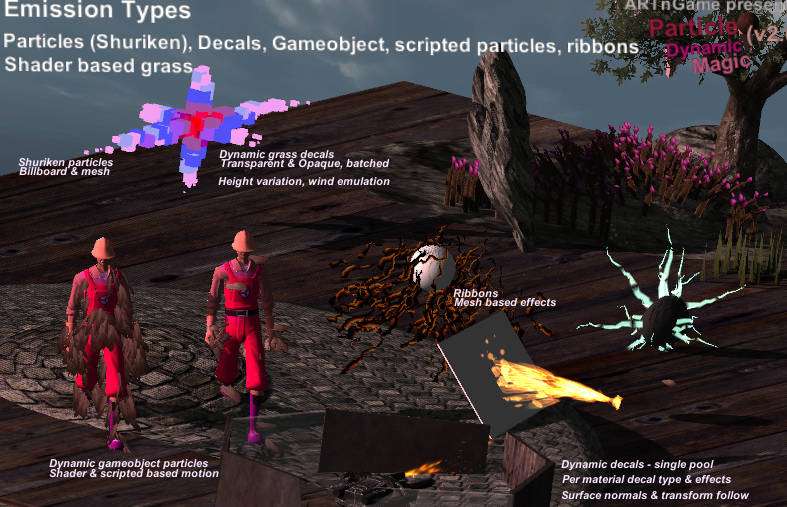 The Particle Dynamic Magic system contains everything one needs to control particles in the most creative and unique ways. Spline editor and emission, Turbulence and forces, Particle Painting and propagation, Skinned/procedural mesh emission, Terrain and projection conformation are some of the new features in v1.2. Version 1.3 includes new features like the Transition Manager, the gameobject painter, the music module (MUSICles) and masked mesh emission. The new version 1.5 includes advanced dynamic effects (fire and ice), advanced collisions (particle to particle), animated gameobject particles for unlimited control, refractive water streams, guided missile effects, new bonus cartoon pack and much more. The new Static & Dynamic batching mode in v1.6 allows great performance and minimal draw calls in refractive effects and particles. Version v1.7, among the many new features offers more Transition Manager options, for total control of the transitions, script injection for dynamic effects on the targets & a multi targeting system for spells. The new version 2.0 takes the asset to a new level, with a big range of new features and controls, a new 100+ ready to use FX library (for 300+ total FX), extended dynamic decals with material awareness and optimizations with new pooling and single source emission techniques. The demos are dynamic and it is possible to interact and play with the manipulation spheres and toggle the background to better view some of the effects. Clicking on "Settings" will open up various options for some of the effects. Use the "c" button to lock the camera and allow easy manipulation of spline nodes.. 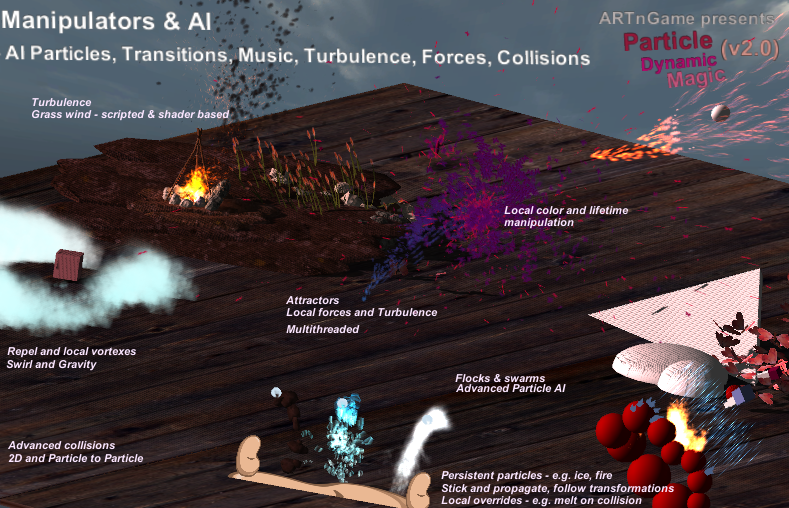 Particle Dynamic Magic v2.0 development thread (Unity forum). See the future. *Angry Bots complete demo is included in Advanced FX Creator bundle. 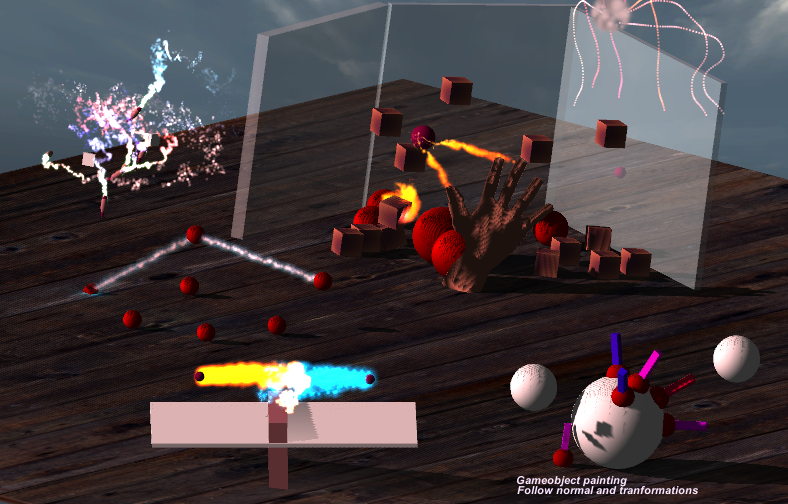 The Angry Bots demo scene & scripts for Particle Dynamic Magic are also available on demand.